Today’s independent living and assisted living apartments have succeeded in achieving the kind of appealing, well-designed and comfortable environments and amenities people enjoy during all stages of their lives. But until now, long-term care for America’s aging population has been relegated to designs of the past with a model that looks and feels extremely institutional and isolating. Fortunately for both long-time Charlotteans and newer residents to the area, Southminster is busy shattering the decades-old long-term care model to create a health center that feels like a home rather than a hospital. As part of its current $120 million expansion, the Life Plan community on Park Road in South Charlotte is quickly becoming known as an early-adopter of the small-house model of long-term care, a person-centered approach focused on individual physical and social needs. To achieve its life-changing objectives, Southminster is working with Perkins Eastman, a global architecture firm guided by the belief that design can have a positive and lasting impact on people’s lives. “We design for a sustainable and resilient future,” says Perkins Eastman’s David Segmiller, Principal in the Charlotte office, “by embracing concepts and ideas that can enhance the human experience through the built environment. Southminster shares our passion for the evolution of environments and their ability to help people – from quality of lifestyle to quality of care.” Locally owned Rodgers Builders, the company that has helped deliver many of the region’s most recognized senior living projects, is general contractor for Southminster’s new health center. 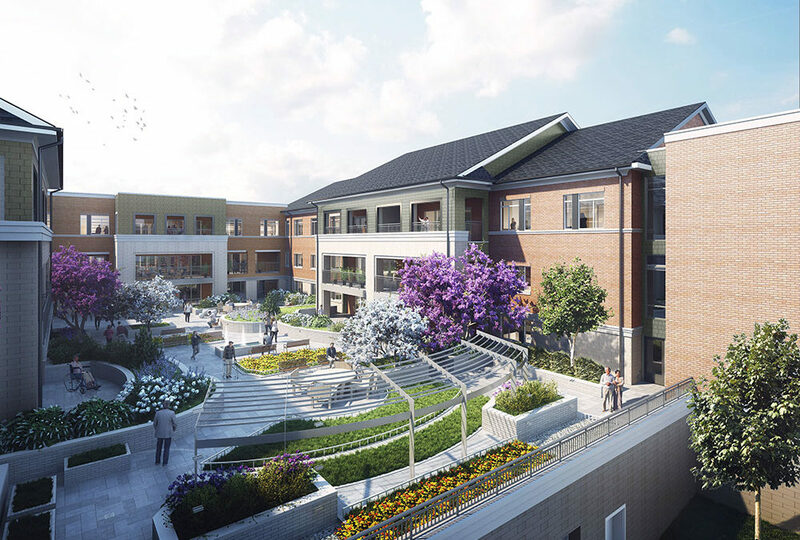 The center will house 60 skilled nursing beds in private rooms with private baths and showers, and 25 assisted living apartments, each with one bedroom and bath. It is also designed for 12 inpatient rooms for use by the Levine Dickson Hospice House. The new health center will include common spaces that link to existing independent living areas of the Southminster campus. This innovative, connected design allows loved ones to stay seamlessly linked under one roof, while providing residents new opportunities for social connection. In addition to the new health center, Southminster’s campus expansion features the new Southminster Terraces. Phase I consists of 30 new apartments, all of which are already reserved and set for completion by January 2019. Zoning has been approved and design is currently underway for the second phase of the Terraces, with the construction of 36 new apartments expected to begin this fall. A leader in the field of aging, Southminster is a non-profit, charitable lifeplan community, providing innovative living solutions to aging across a full continuum of care. Dedicated to overall well-being, Southminster embraces living life with purpose by valuing independence and privacy, inspiring creative passions, encouraging lifelong learning, and motivating each individual’s plan for wellness to its highest potential.